The Horror Movie BBQ: August Loot Crate Delivers Happiness! Jealous? Yes you are. Stickers and bookmarks and many other goodies. But that will be for a future entry. I can't give it all away! So, last night, after a very long and tiring day, my loving lady presented me with an amazing gift that is essentially makes it hard to follow up. In fact, it's a number of gifts in a nice little package. It's a LOOT CRATE!!! 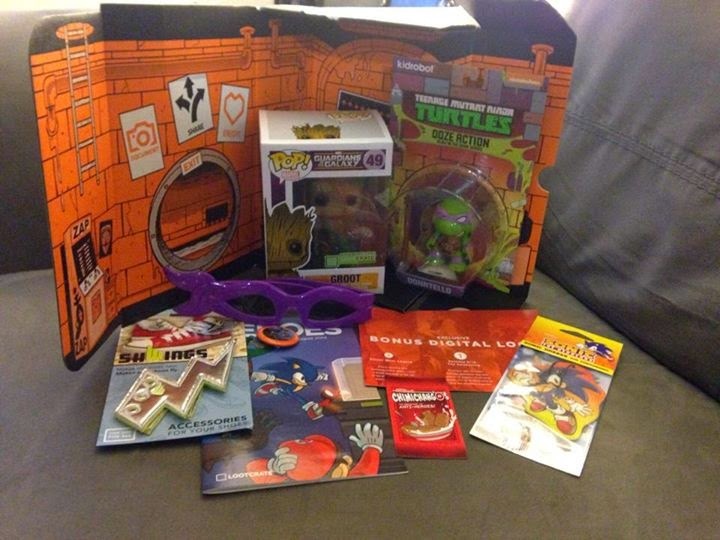 So, Loot Crate is a great subscription service for us geeks that delivers great geeky goodness every month. What you see above is my first(and nowhere near last) package. Now, my iPhone camera wasn't the best choice to take photos of these goods so the pictures do it no justice. 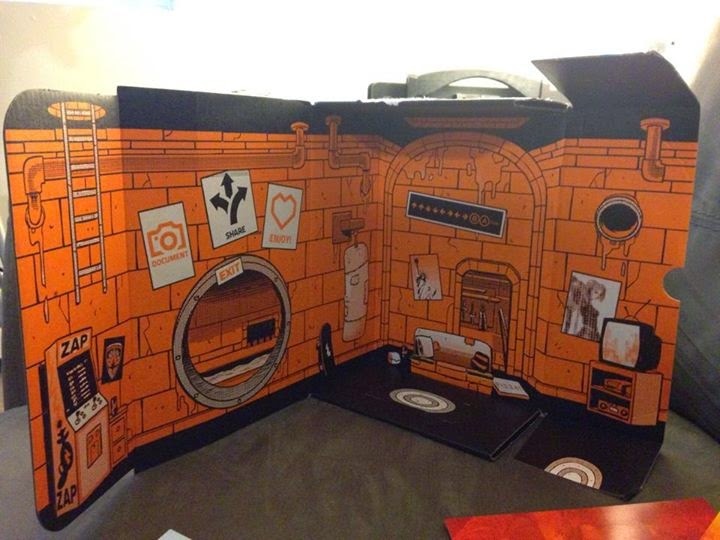 It's really a spectacular set that one must hold in their hands to truly appreciate it. Let's go through the contents shall we? 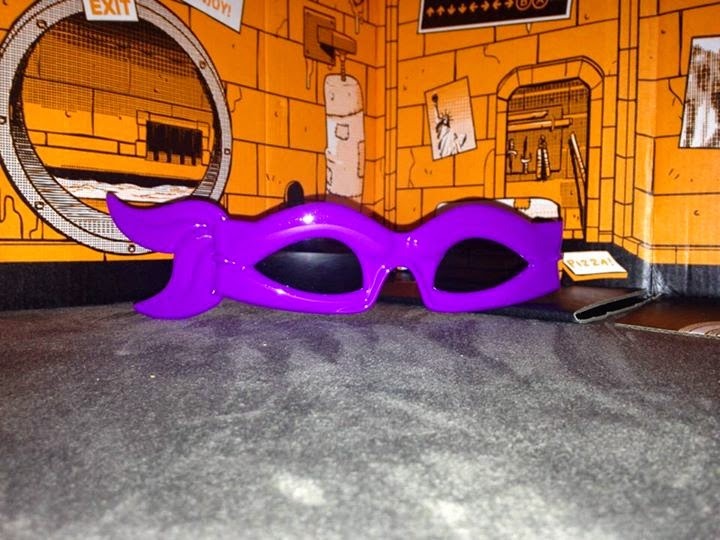 A mini Donatello figure and Donetello-mask shades?!? Yo. Seriously. Stop it. I don't think I need to continue reviewing this. 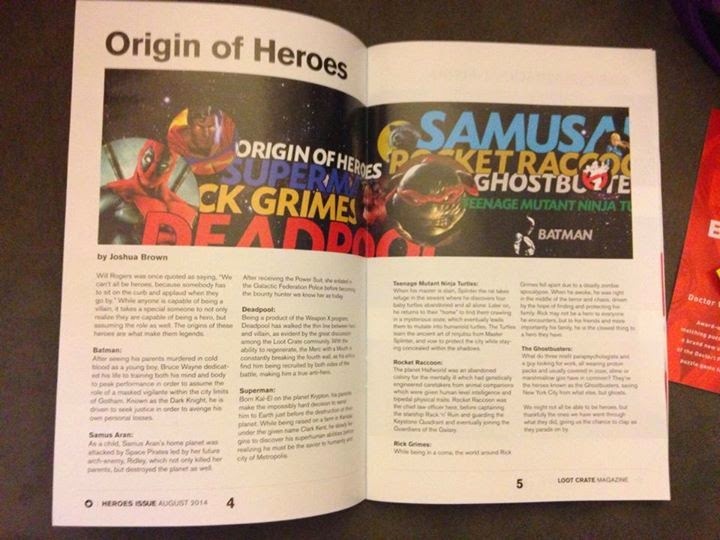 The two photos you see above this paragraph alone should drive you over to their site and order your box for September. 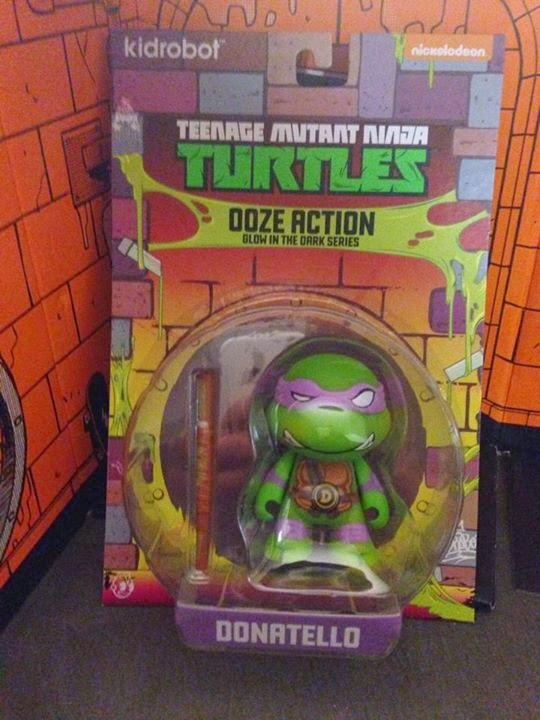 Now, Donatello may not be my favorite Ninja Turtle, but I'll be darned if I'm not going to build a collection of these mini figures from KidRobot. This vinyl mini figure is just one in the line of vinyl minifigures featuring the Turtles themselves, Splinter and that human can opener, The Shredder. It's awesomeness and collectability factor is at a ten and the other 5 will be mine in no time. The sunglasses, thankfully, ARE adult sized. Which means I can wear these to work on a hot day. Seeing as I work outside at a summercamp where goofiness is encouraged, these are a perfect companion to those long days. Nobody will yell at a 6'4 man with Ninja Turtles shades. No one. That Senior Executive job will be mine in time. Thanks to Guardians of the Galaxy, Groot-Mania is running wild, brother. Sorry, Lord of the Rings, there's a new contender for the world's favorite walking tree. And with this exclusive Pop Funko bobblehead, I can now join in on the fun. Yes, I'm the only person on the planet who has yet to see the movie, but I already know I'll walk out happy. And I'm also the last one to jump on the Pop! figure craze. These things are amazing and I've been wanting to start a collection and thanks to Loot Crate's deal with Funko, I can potentially get an exclusive every month. Yup. 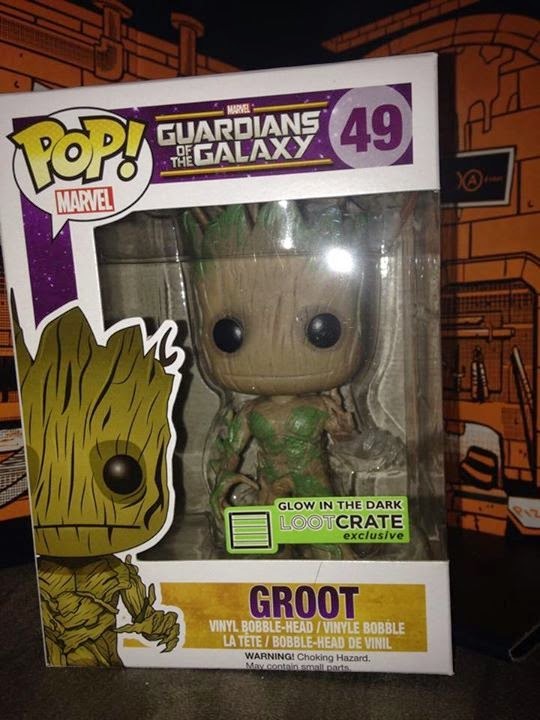 Loot Crate has their own exclusive Pop! figures every month. Looks like we picked the right month to get started too. My girlfriend kept remarking how adorable he looked, so I have faith our Funko collection will be growing over time. 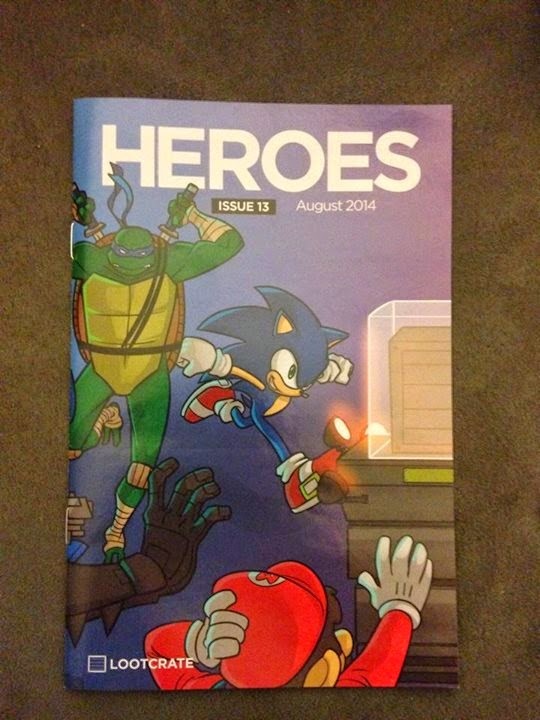 A new air freshener featuring Sonic the Hedgehog, a Deadpool magnet and an exclusive pin. Now, it's a well known fact I'm a huge button and pin collector and anytime I can get my hands on one that represents a special happening, I'm all over it. My assumption is they come in every month's delivery, so it's an even bigger incentive. 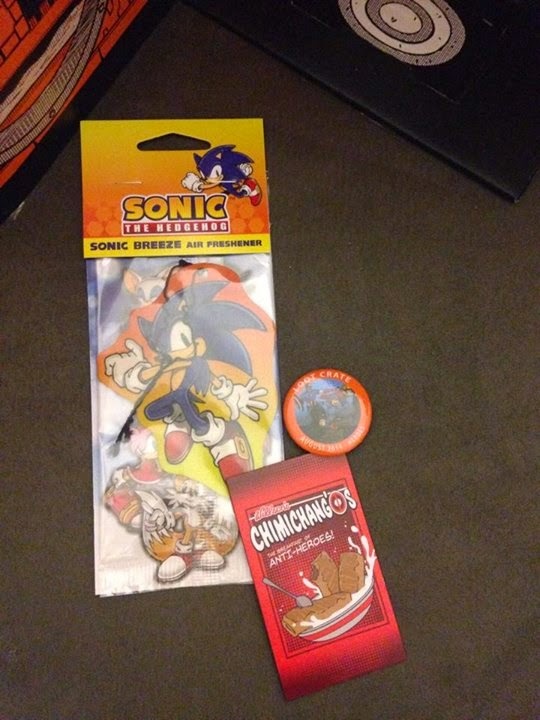 Also, the Sonic air freshener can replace the extinct Halloween air freshener I've had in my car since 2010. It's about time I found a new one. 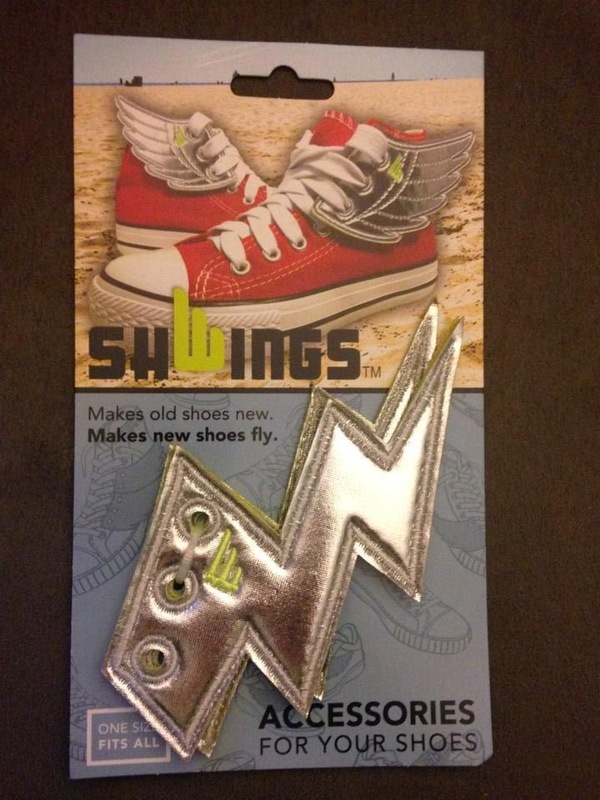 These "Shwings" are essentially lace on wings you put on the side of your shoes. Now, personally, I won't be wearing them, but I feel like they could give me the confidence that I can run in public a thousand times faster and be taken seriously. Just like the sunglasses, no one is going to be questioning a grown man with wings on his shoes. 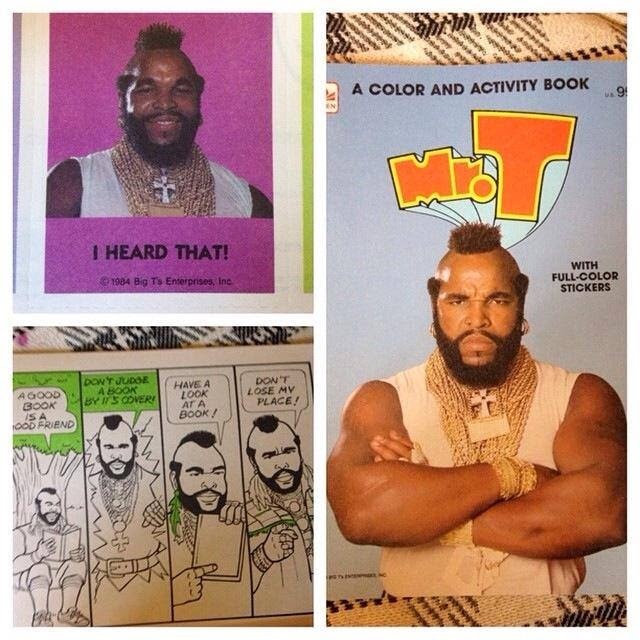 Rounding out the package is the Loot Crate mini-zine. An article here discussing the theme of the month, a few photos from social media, and a look at the golden contents in this lovely box. A fun read. Definitely a nice collectible. For a birthday present, this is amazing. But imagine getting a birthday present every month to this caliber. Mind blowing. And it's relatively inexpensive. You're looking at under 20 bucks a month shipped for goodies valued way over that. I can't suggest this highly enough. So plese head over to their site at Loot Crate.com and indulge yourself into beautiful geeky goodness. Now, leave. I have a battle between Donatello and Groot to start. They want those Shwings and only one can truly own them. Hey there! I'm a Loot Crate vet going on almost a year now.